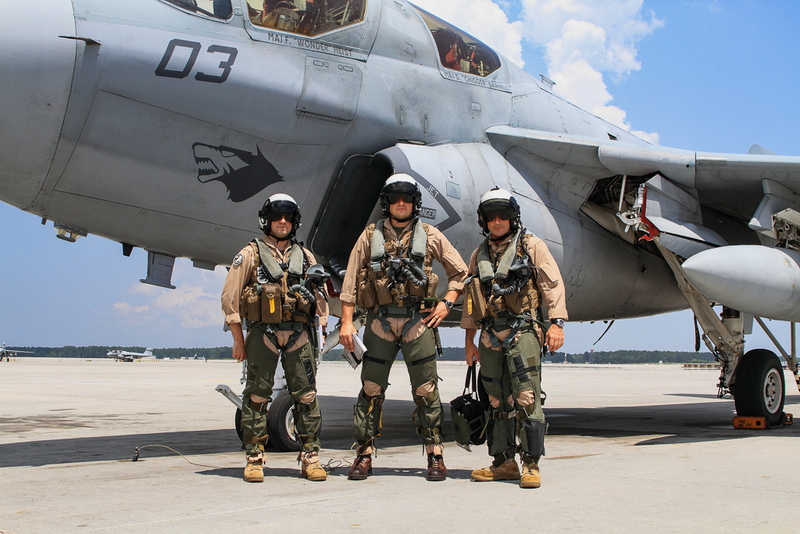 APD’s Ed Rivera visited Marine Corps Air Station Cherry Point in North Carolina back in June and spent some time with Marine Tactical Electronic Warfare Squadron 3 (VMAQ-3). 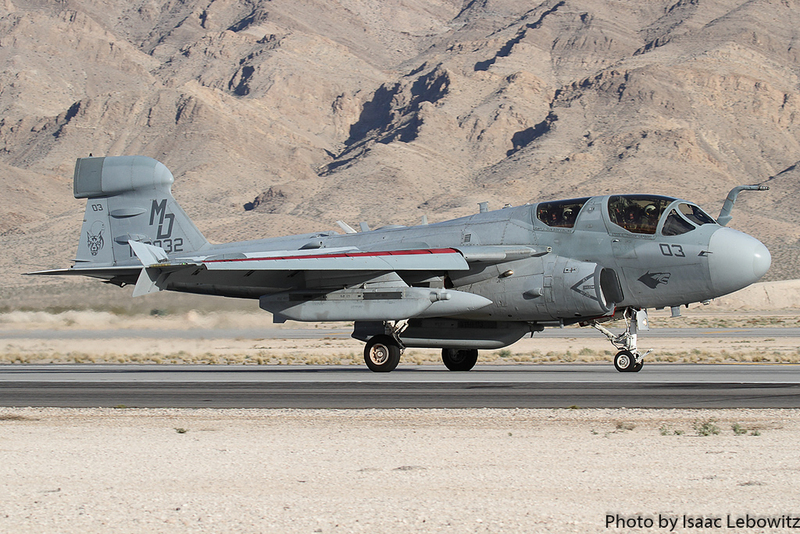 VMAQ-3 is back home after participating in exercises Red Flag and WTI. 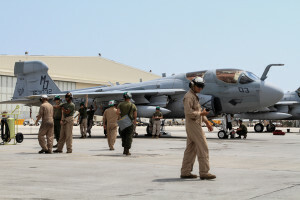 hether it is a deployment to Qatar, supporting large-scale exercises such as Red Flag and Weapons and Tactics Instructor Course (WTI), or training with Harriers and Hornets locally, the past few years have been very busy ones for Marine Tactical Electronic Warfare Squadron 3 (VMAQ-3) “Moon Dogs”. 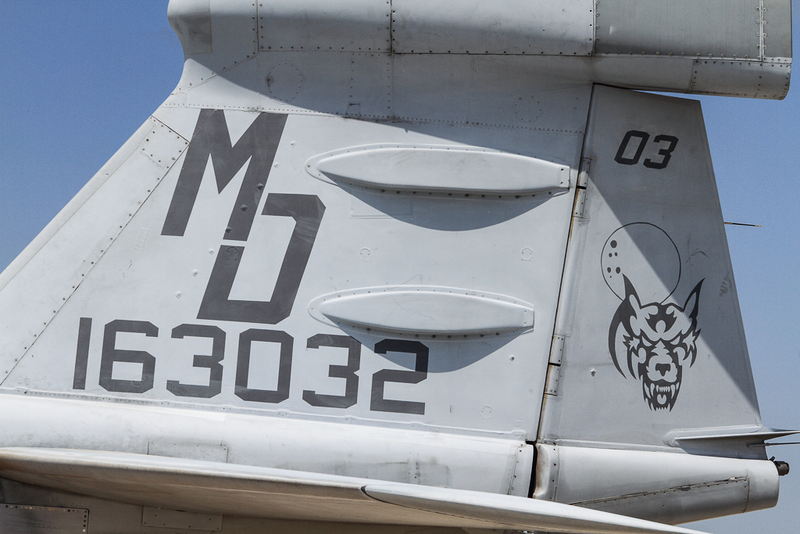 With roots dating back to 1952 with the commissioning of VMC-2, which evolved into VMCJ-2 and was responsible for electronic warfare and photoreconnaissance. 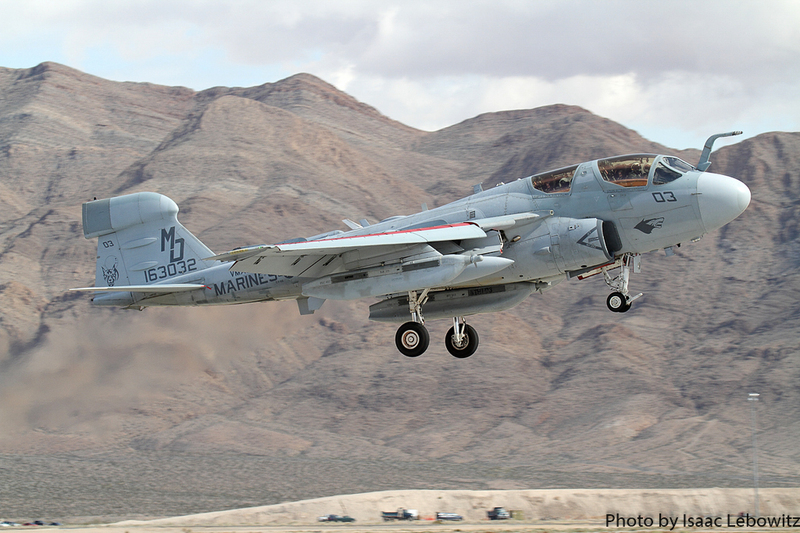 VMCJ-2’s electronic warfare and photoreconnaissance responsibilities were separated and VMAQ-2 was born. 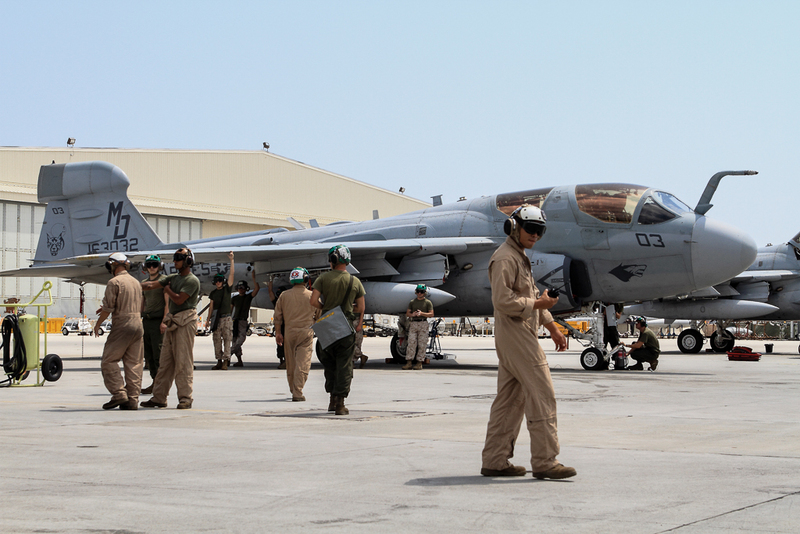 VMAQ-2, one of the largest Marine Corps tactical units at the time, was re-organized into three detachments to enable the unit to support the Marine Corps’ global mission. 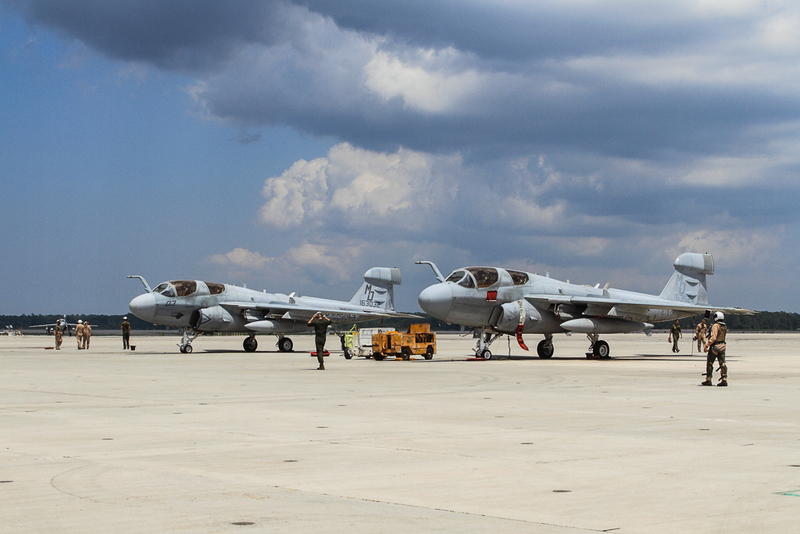 These detachments: XRAY, YANKEE and ZULU went on to become VMAQ-1, VMAQ-2 and VMAQ-3. 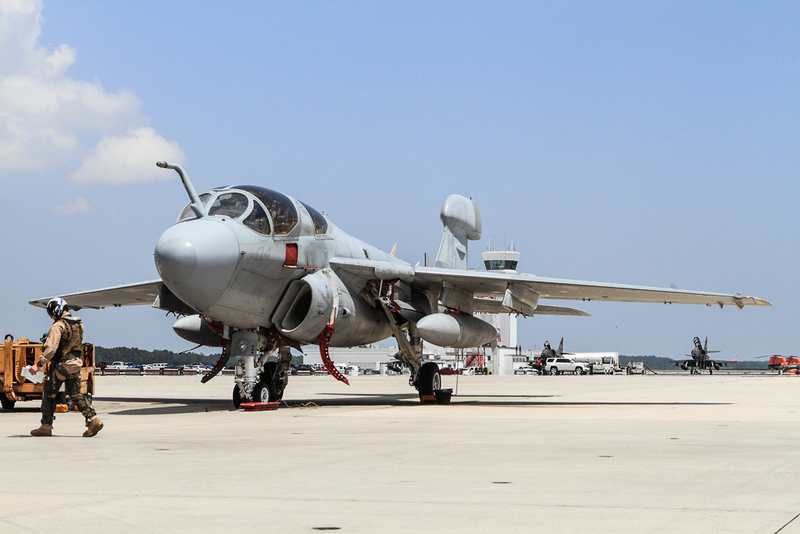 Formerly Detachment ZULU, VMAQ-3 was commissioned in 1992. 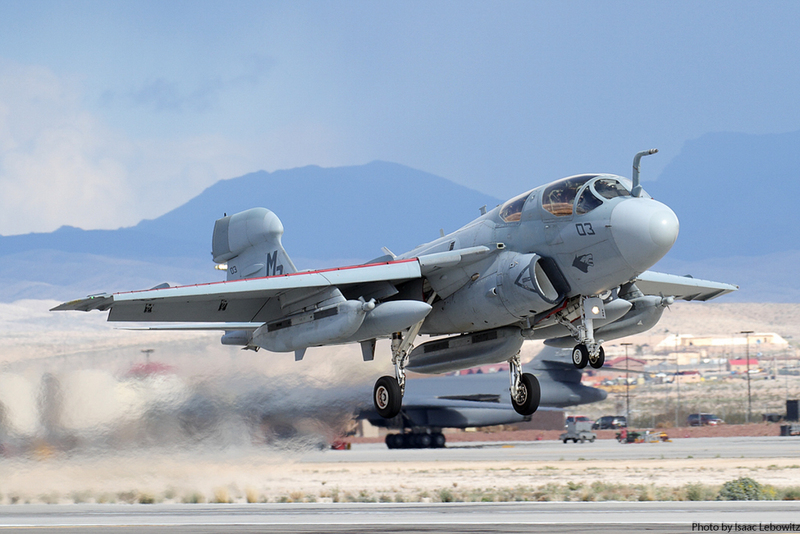 More specifically, VMAQ-3’s mission encompasses electronic attack (EA) and Suppression of Enemy Air Defenses (SEAD) in support of Marine TacAir units as part of the overall MAGTF. 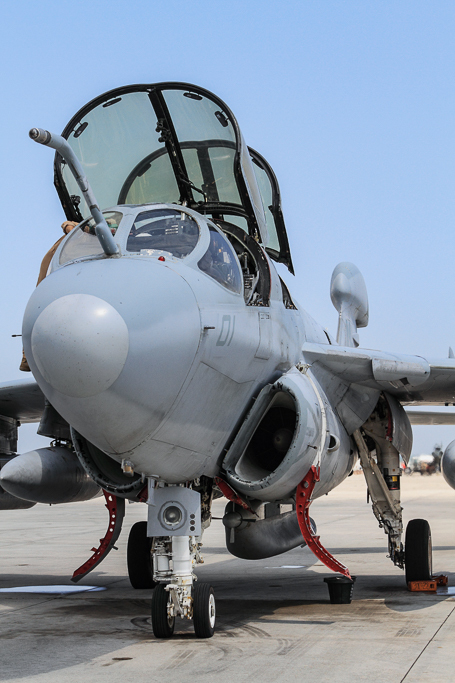 With the EA-6B Prowler, this is primarily accomplished through interruption of enemy electronic activity while gathering any electronic intelligence and communicating it back to the MAGTF, joint and/or coalition forces. 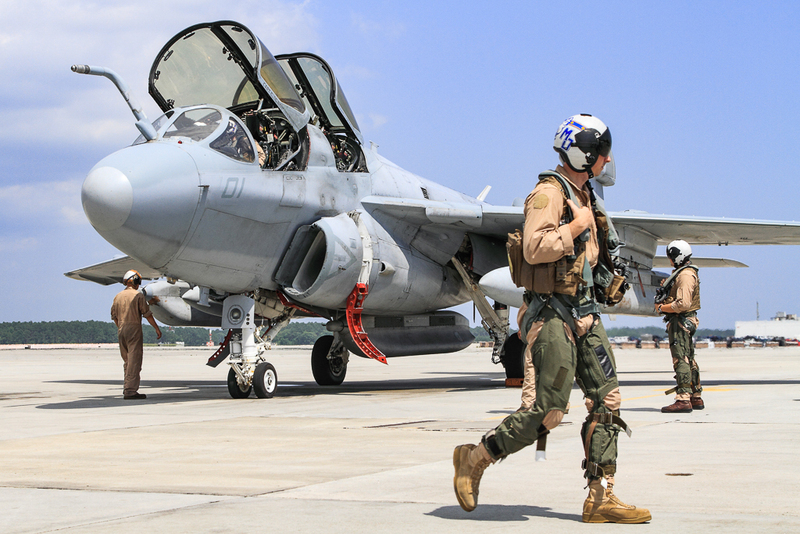 With digital interoperability, the integration of manned and unmanned airborne and ground EW capabilities will provide the MAGTF commander with greater flexibility and control of EW than he has ever had before, according to the 2015 Marine Aviation Plan. 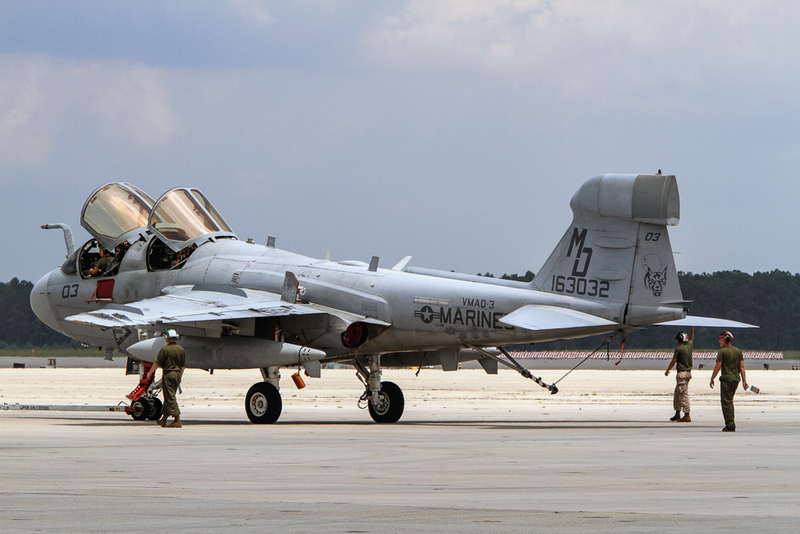 MAGTF EW assets will be modular, scalable, and networked, utilizing an open architecture that is rapidly adaptable and remotely re-programmable at the tactical level to support future Marine Corps warfighting strategies. 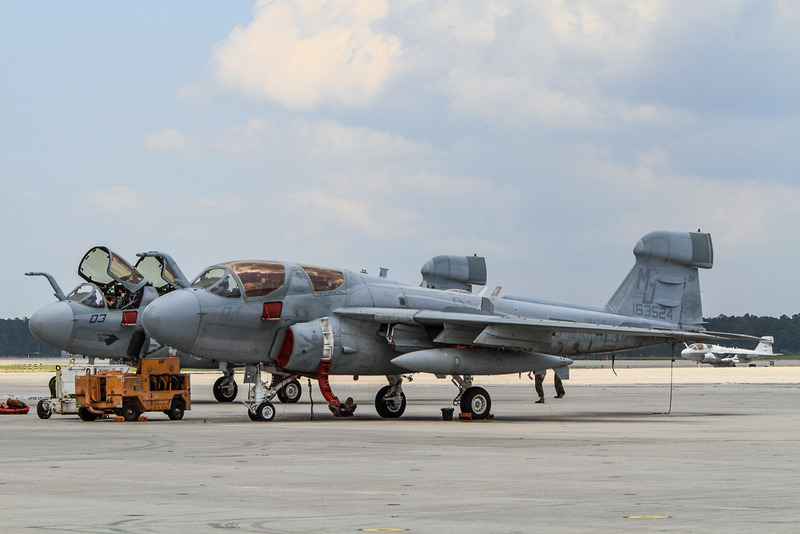 While not much can be done to upgrade the Prowler as a legacy airframe, the technology used in the Prowler is continuously being upgraded. 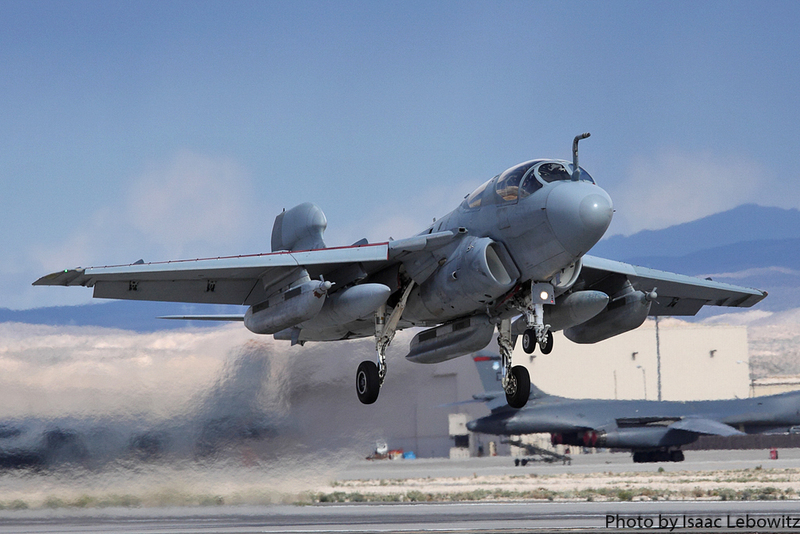 Marine Prowlers are equipped with five tactical jamming pods, electronic surveillance systems, radar-seeking HARM missiles, non-kinetic fire systems that leave electronic equipment disabled but intact, and countermeasures that mask the approach of our nearby ground-attack aircraft. “They have upgraded the sensors themselves. The ALQ-218, which does our receiving and sensing of the electronic environment. 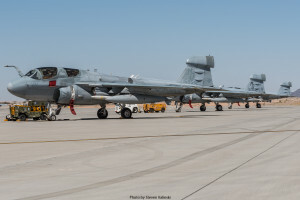 The ALQ-99 pods largely remain relatively unchanged, the changes that you see are in the guts, they are in the software, and those are always keeping pace.” LtCol. Manka said. 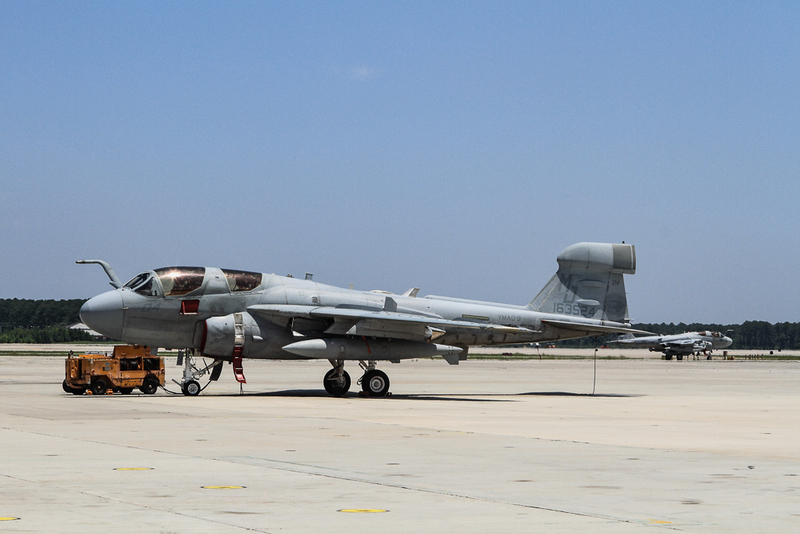 Improved Capability (ICAP) III is a series of upgrades that are part of an enhanced electronic attack weapon suite. 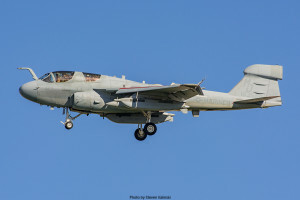 According to a spokesperson for Northrop Grumman Aerospace Systems: “The ICAP III upgrade provides rapid detection, precise classification and highly accurate geo-location of electronic emissions such as radars.” ICAP III has performed very well in combat deployments over the past few years. 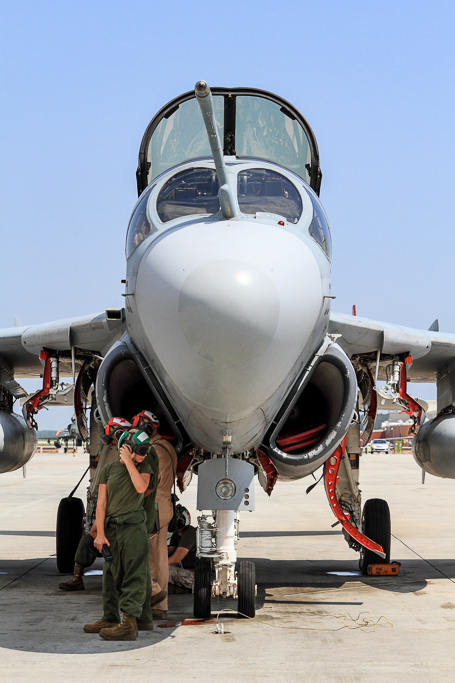 The ICAP III system is also incorporated into the EA-18G Growler which is used for similar missions by the U.S. Navy. 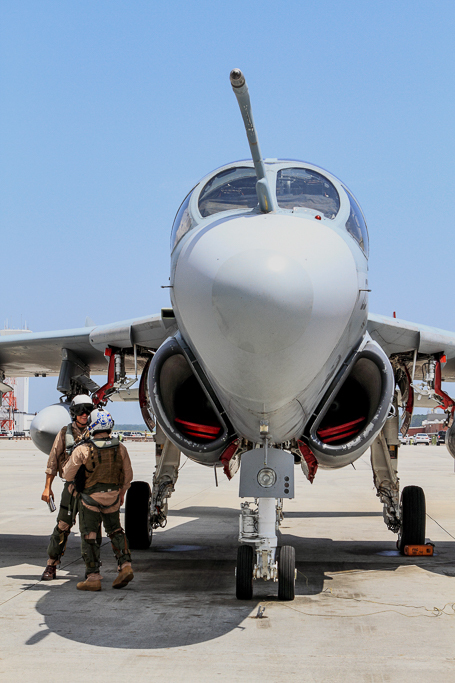 “After that, I think you have to look at the jammers, the ALQ-99 pods that we carry on the wings, or on the centerline store. 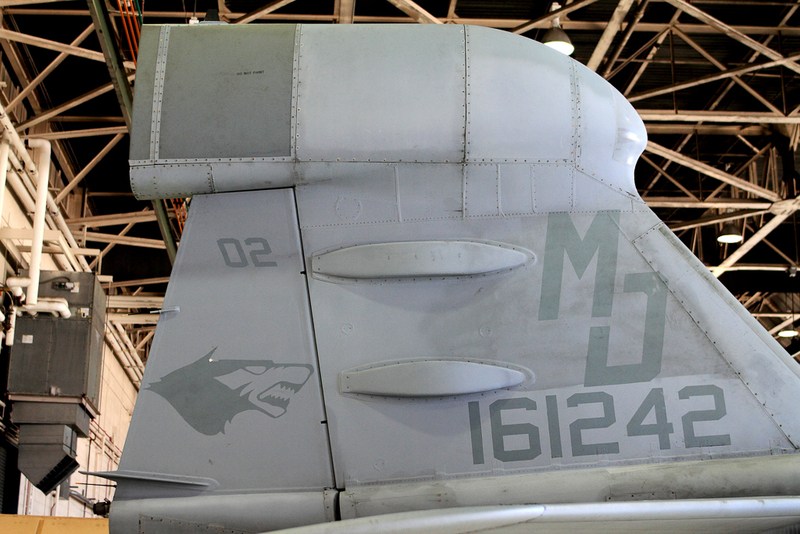 You couple that with the USQ-113, the blade that’s on the fuselage, that’s your teeth in the fight. You couple that with the (HARM), the missile coming off the rail to assist in your suppression of enemy air defense, and then there are some other pieces that folks often forget about and that’s: bulk chaff (countermeasures). 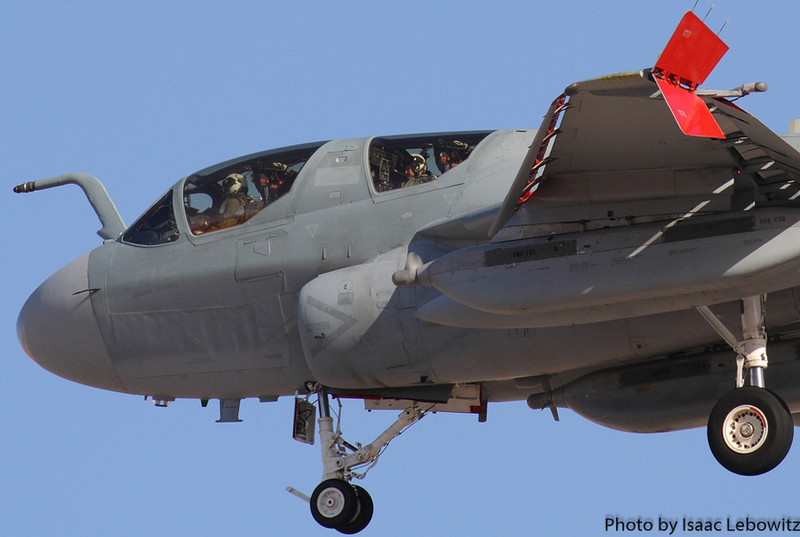 We have the ability to do bulk chaff dispensing off the plane, and relatively new to the community, in the last couple of years, we can carry a LITENING pod for non-traditional ISR (NTISR). I think when you bring all that stuff together, and you can flex from mission to mission on that load-out, it actually gives you a pretty amazing capability that you bring. 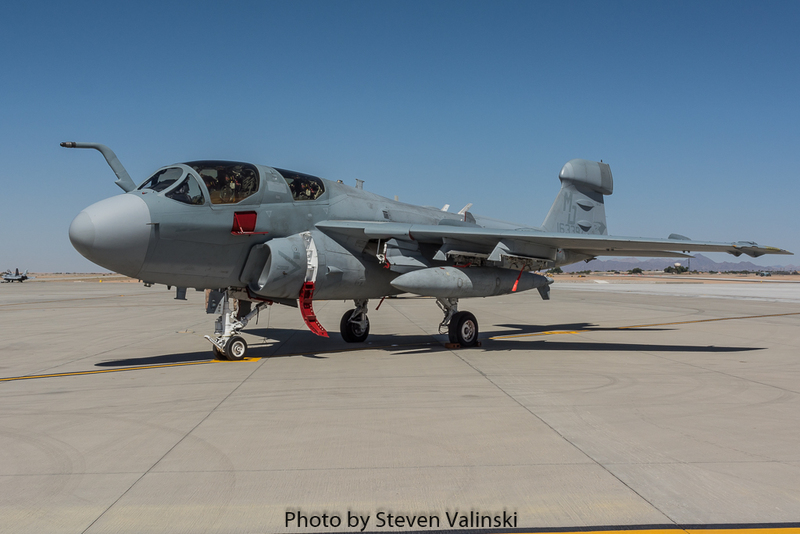 Whether you’re working in a permissive environment where you’re doing non-traditional ISR or you’re kicking in the door or doing our traditional day one, wave one, suppression mission, we’re going to bring that weapon system to bare however we need too,” LtCol. Manka added. 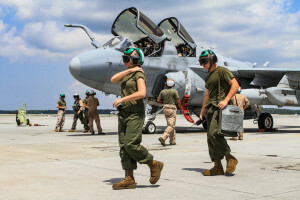 This requires making the best out of every opportunity and maximizing the return on the hard work that was put in by many in preparation of the sortie. “We have to be creative in what it is that we do every day, it’s squeezing every ounce out of that flight hour. 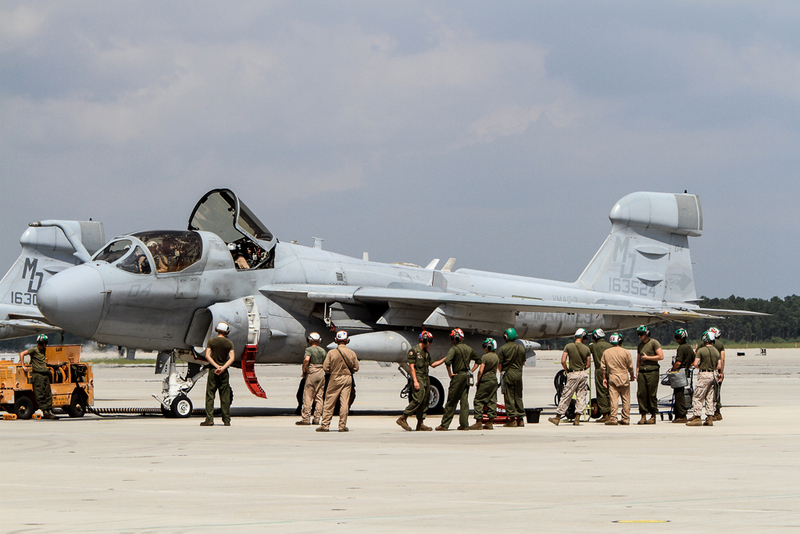 There’s a lot of effort and work by those maintainers that goes into putting one flight hour up on the schedule. So, with that, it’s finding an approach to integrate and plan and, particularly, debrief. Everyone one of us takes the time to plan, train and execute each mission. 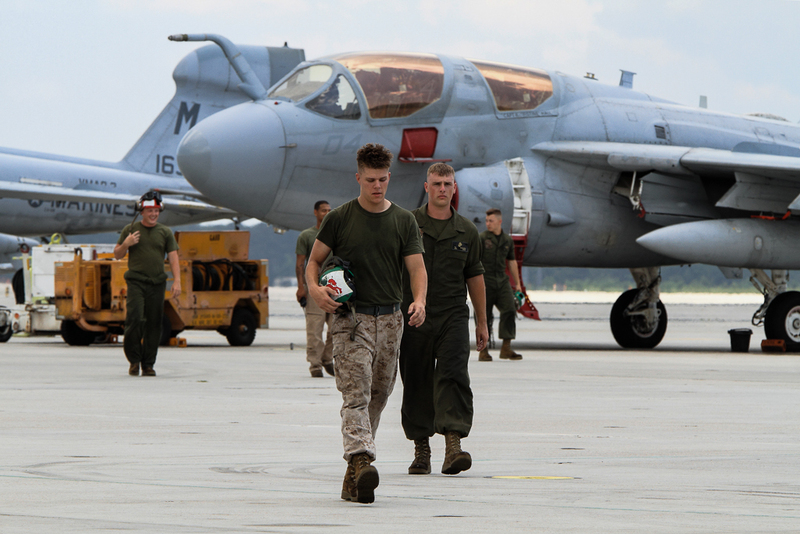 You can get out of that mundane piece by being a thoughtful mission commander and running that next sortie, it’s taking care of your Marines — going out just walking down the flight line, we could turn anything into a little mini-exercise on any given day, which keeps everyone on their toes while providing valuable training for mission success,” said LtCol. Manka. As LtCol. 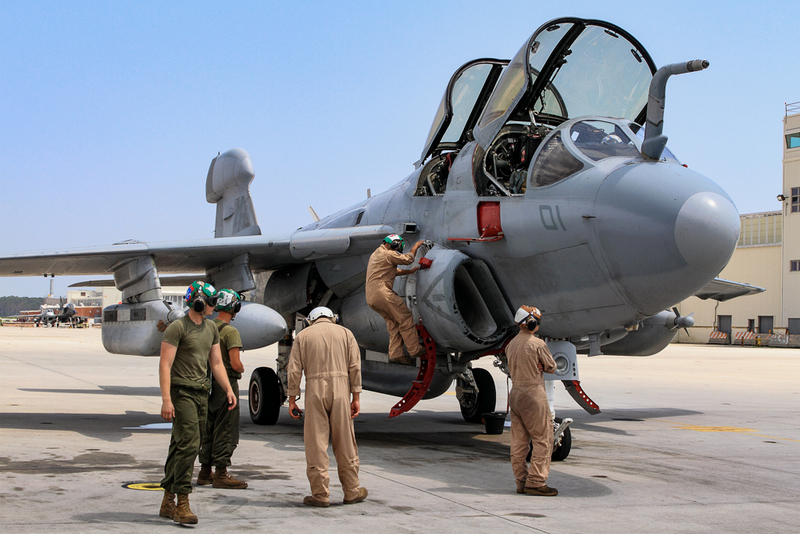 Manka mentioned, maintenance is a vital part of mission readiness. 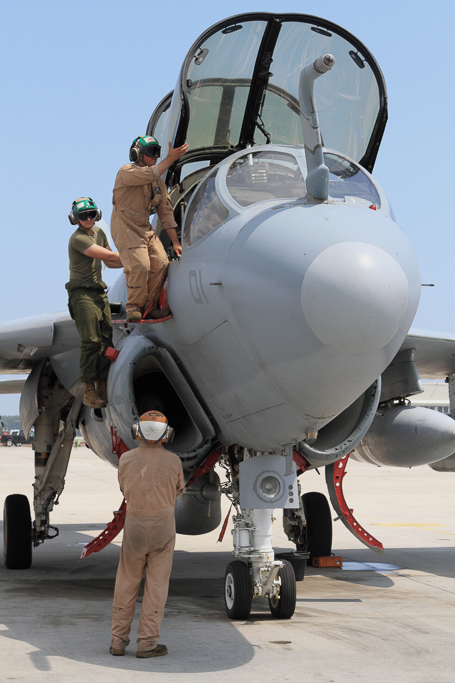 There is a direct relationship between the number of flight hours and the efficiency and effectiveness of the squadron’s maintainers. From a maintenance perspective, this requires long hours, hard work, good communication and a lot of teamwork. This effort intensifies when the squadron is deployed. 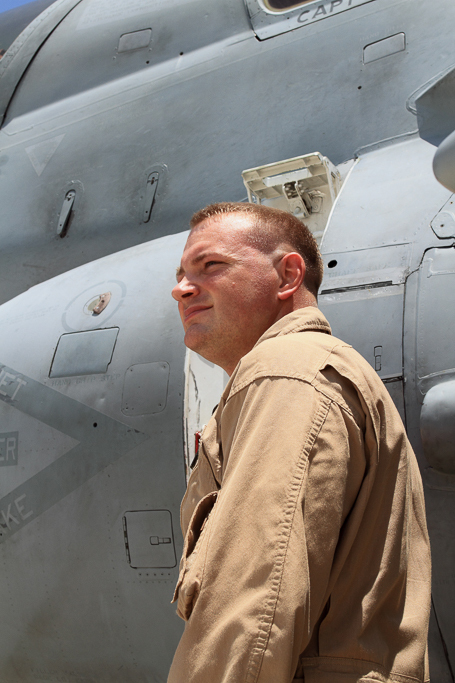 While most deployments are typically scheduled, the Marines have to be prepared to be called upon at any moment. Outside of preparing to be deployed, the typical day-to-day maintenance operations can present challenges. 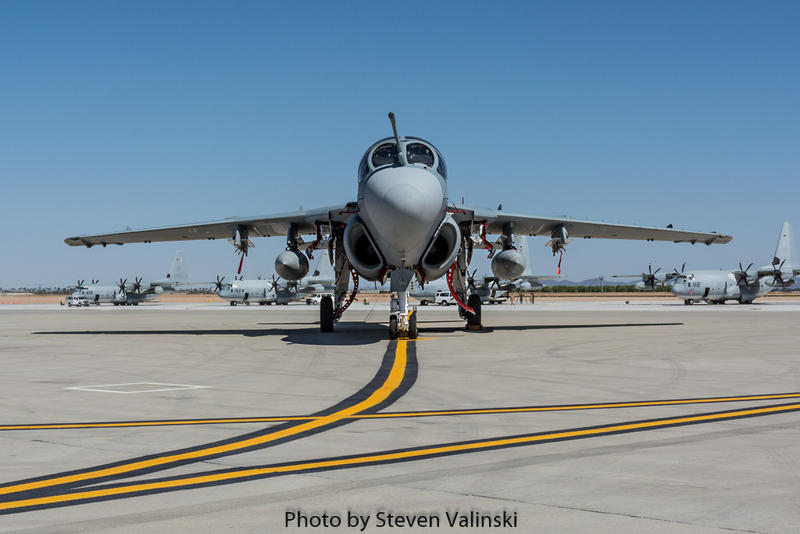 VMAQ-3’s maintainers have contributed to successful deployments the past few years to Qatar, MCAS Yuma for WTI and Nellis AFB for Red Flag, to name a few. 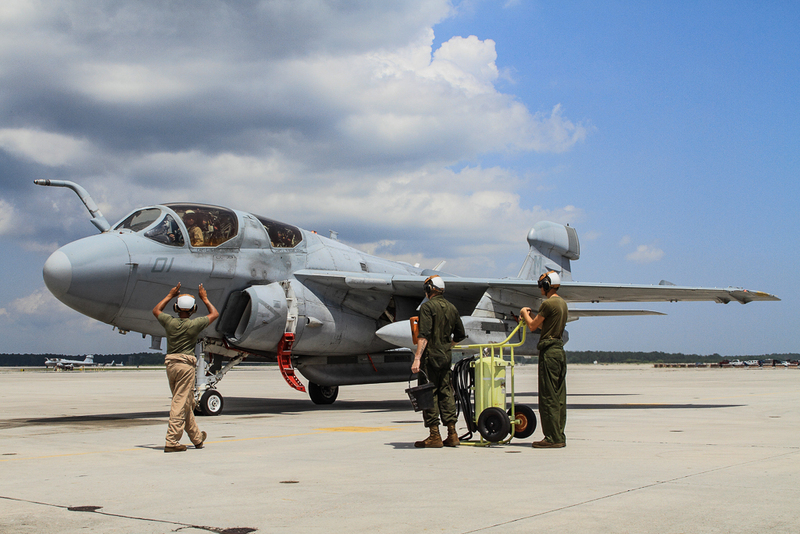 The pilots of VMAQ-3 are always staying busy. 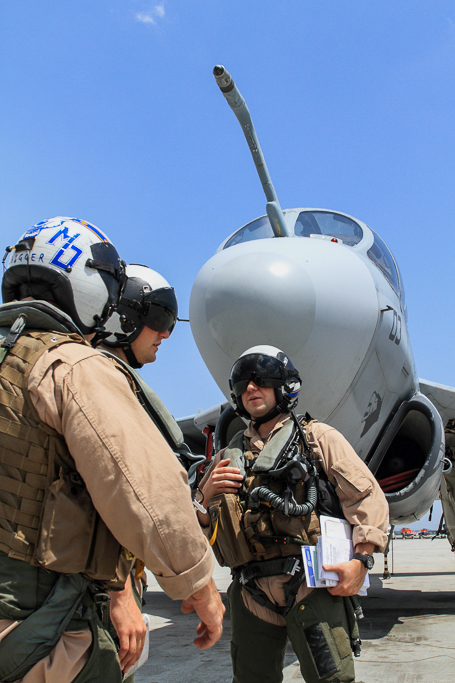 When the pilots are not flying, planning, briefing and debriefing, they have other roles and responsibilities within the squadron. Capt. 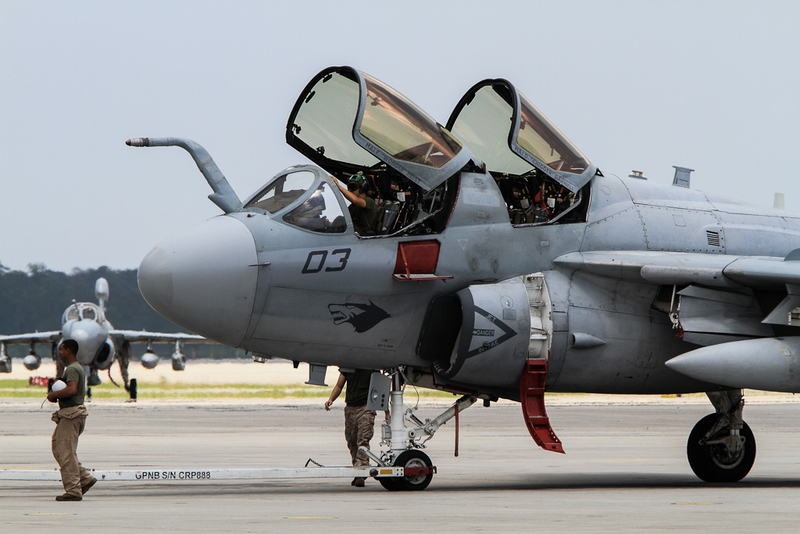 Derek “Big Baby” Geyer, a VMAQ-3 pilot with over 400 hours flying the Prowler, explains the various roles pilots can have outside of flying: “You get a couple of ground jobs that we bide our time with when we’re not flying. Doing something for the squadron administratively, writing schedules, managing maintenance programs, and leading Marines. On the off-time, we study up our mission skills, the tactical side of what we do, the electronic attack and surveillance. 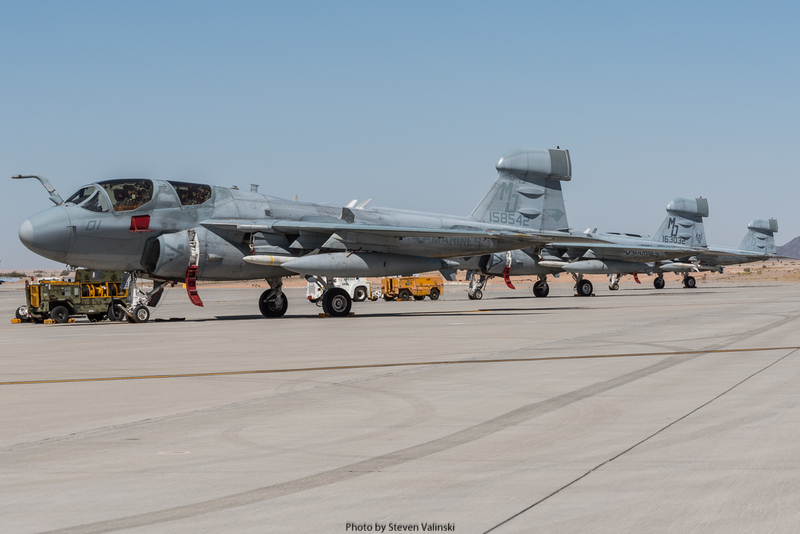 “We usually take a couple of hours usually to prep for a flight depending on the sortie, getting everything ready to go. Some flights we will have a crew planning for an entire day before they execute. 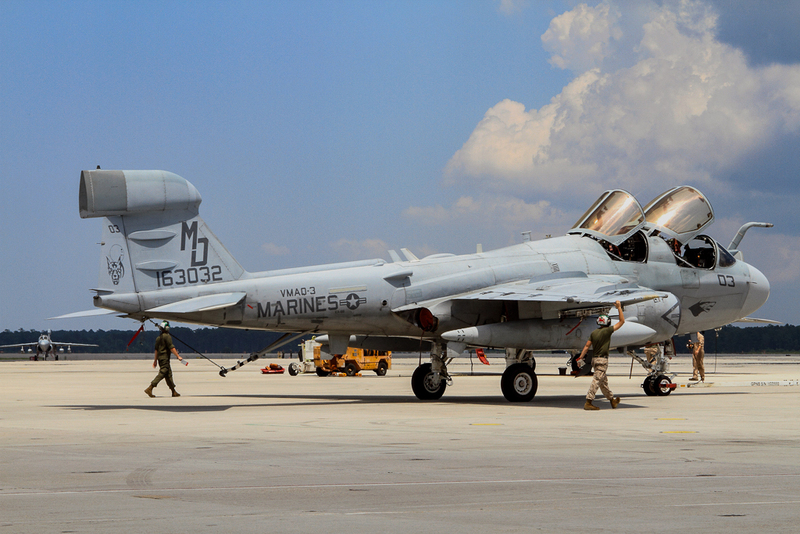 Back here (at MCAS Cherry Point) we fly about once every two days. Deployed, we flew closer to once every three days because they were such long flights and the preparation involved.” Capt. Geyer mentioned. Capt. 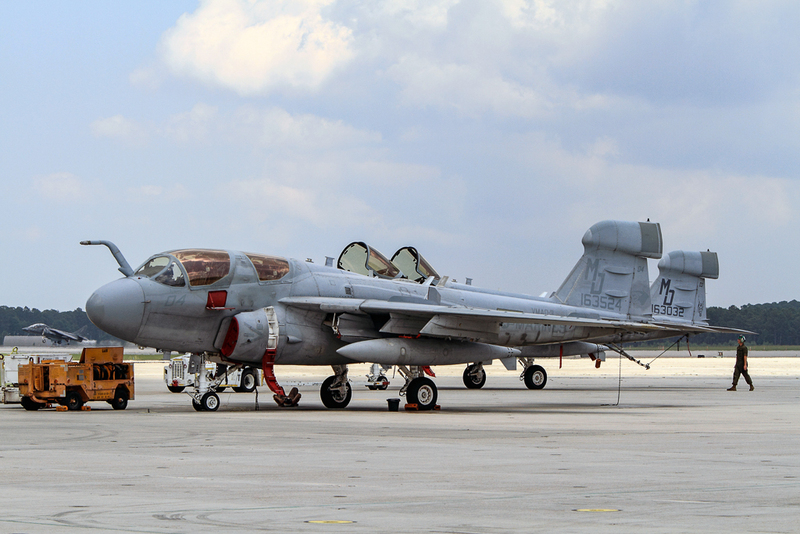 Geyer was on a CENTCOM deployment from February 2014 to August 2014 based at Al Udeid Air Base in Qatar. 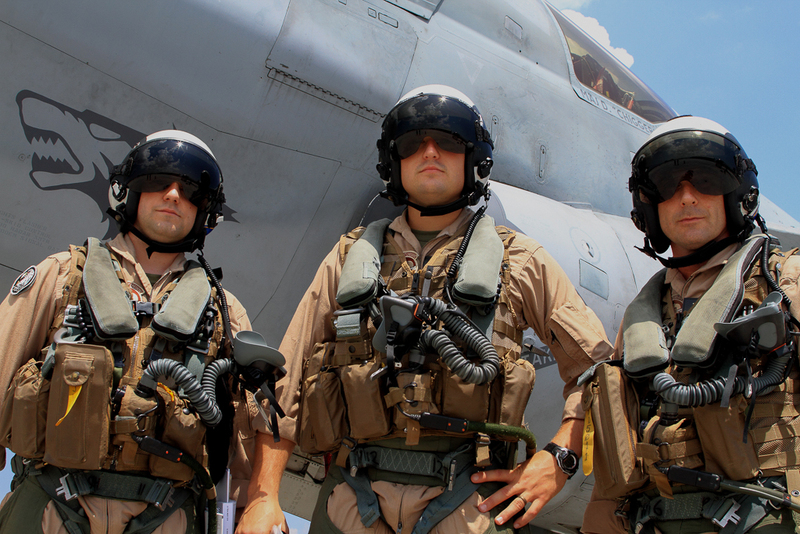 The routine of a pilot changes when deployed, particularly with the amount and type of flying that is done. Flights can be a longer duration and require a lot of stamina and awareness to maintain focus for those flights. “It was my first deployment, it was the whole reason why I joined the Marine Corps, to get out there and do great things. I finally got to do exactly what I spent so much time, almost four years training, to do. It was really a great experience. 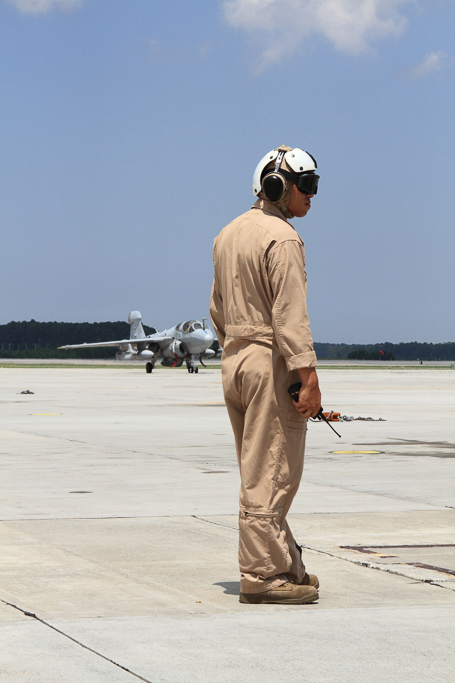 It was a lot work too… my first combat flight to Afghanistan was over 10 hours. 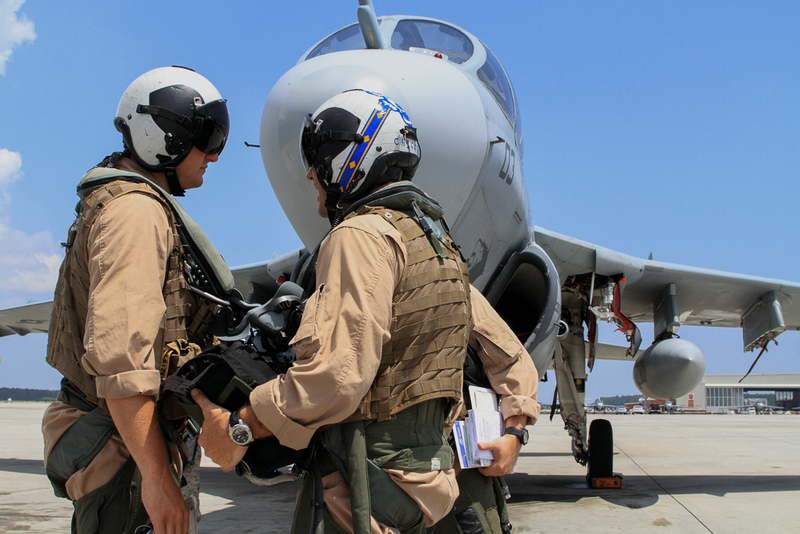 I took off in the evening, flew through the night on goggles, and landed in the morning after dawn, Capt. Geyer told APD. 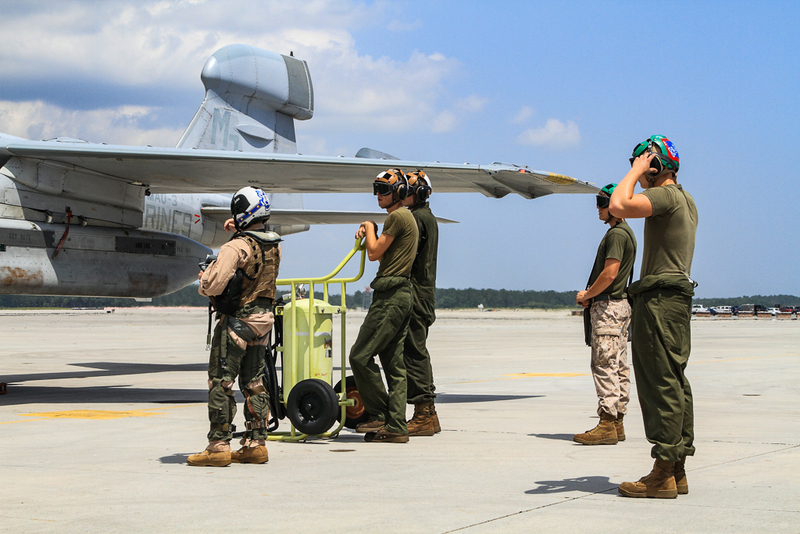 Mid-air refueling can be frequent due to the longer flights. 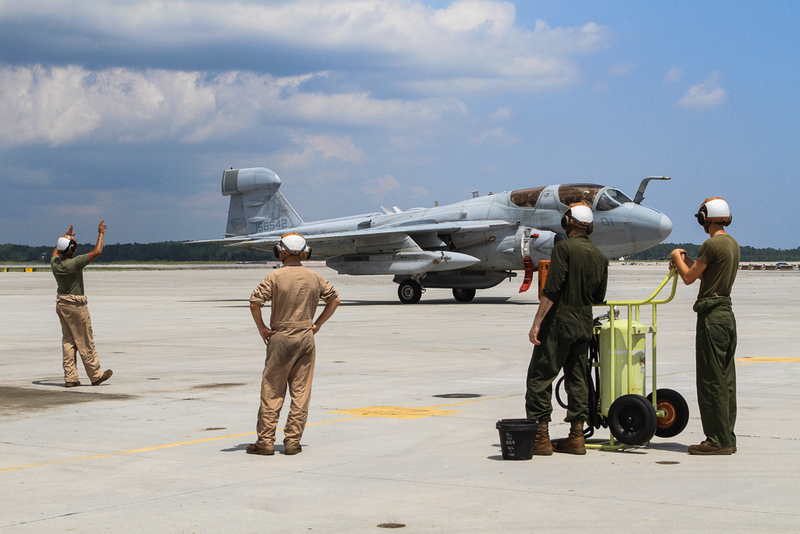 This can be challenging, especially if it was the first time refueling on a particular airframe. However, although challenging, Capt. 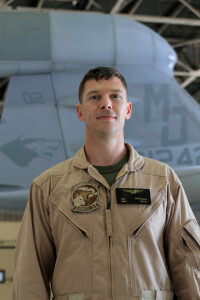 Geyer and his crew executed each mission successfully and professionally. 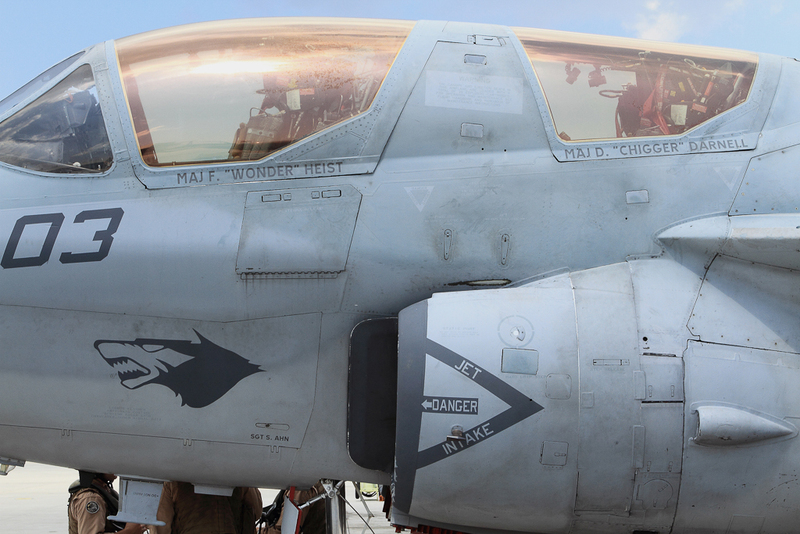 “I never tanked on the KC-135 “Iron Maiden” before that flight during my deployment. 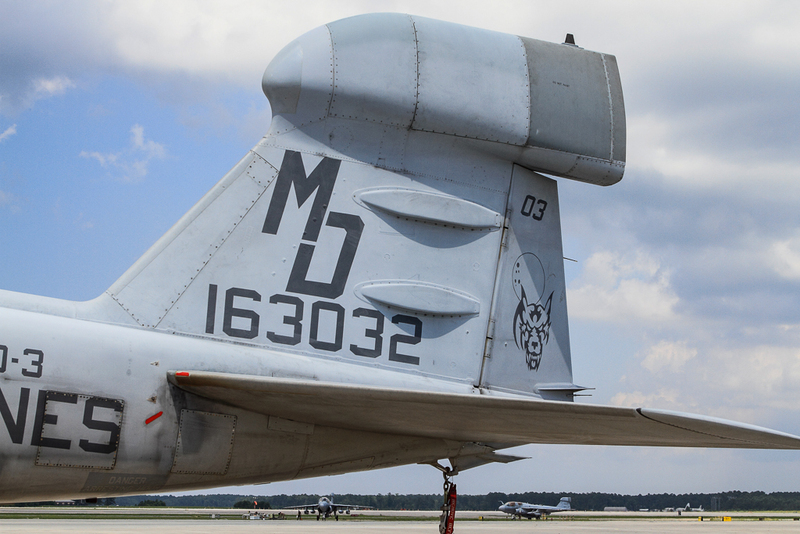 The KC-135 has a 100 lbs. 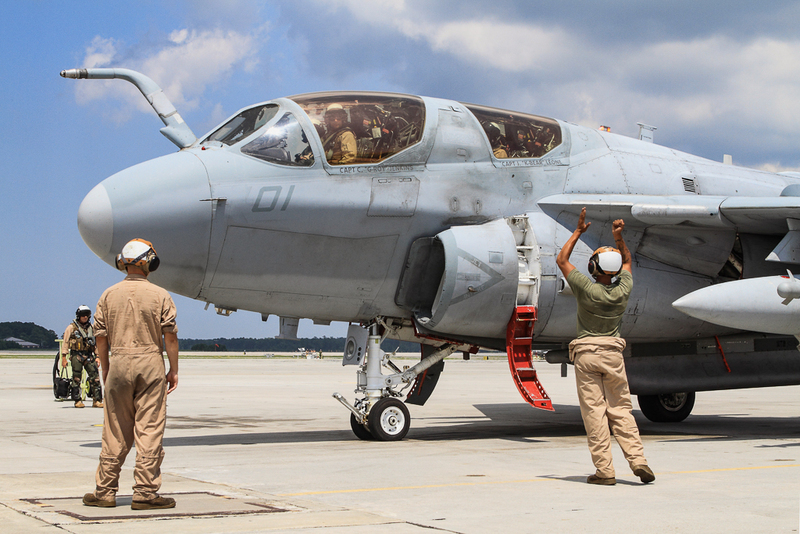 steel drogue that can really bang up a jet if you’re not careful. I approached the basket and the plane had a rudder trim issue, and it was off-set by a lot. So, it felt like I was approaching the basket a little sideways, but after a few plugs, and a lot of sweat, I had it suitcased.” Capt. Geyer said. 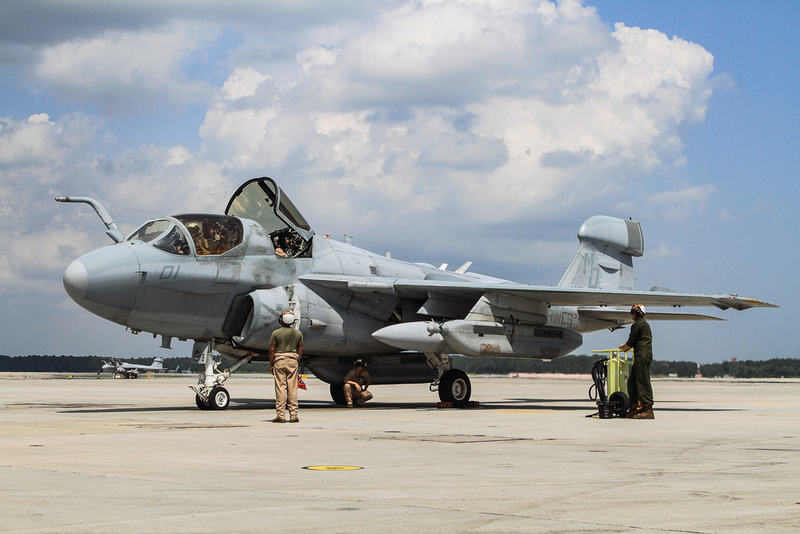 One of the best ways for a squadron to prepare for battle is through military exercises designed to simulate combat experiences and environments. 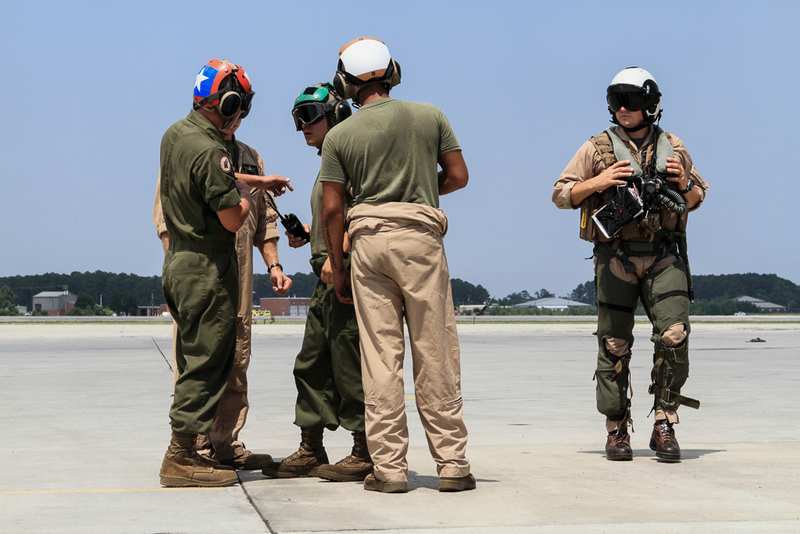 Large-scales exercises such as WTI and Red Flag help squadrons learn how to integrate with other units with different airframes, procedures, lingo, and, sometimes, languages. Learning what each can bring to the table, and how to maximize everyone’s capabilities. 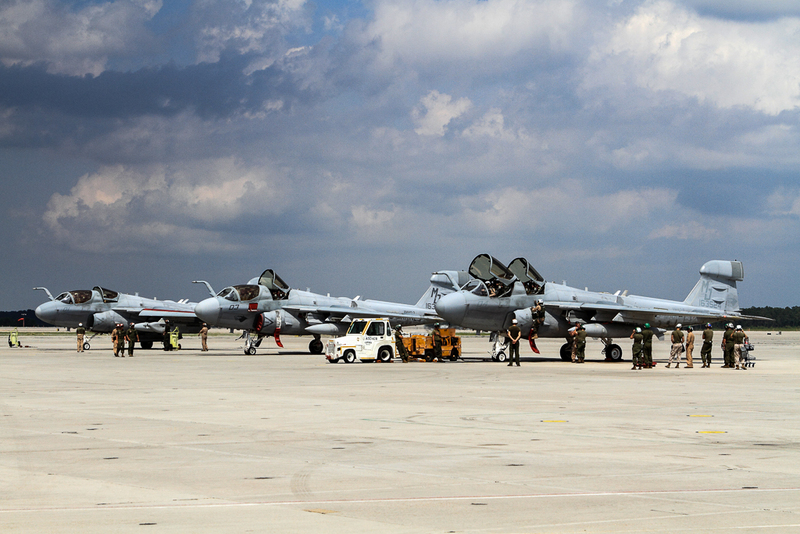 Another benefit to these exercises is to help work on digital interoperability which is the future of armed forces worldwide. 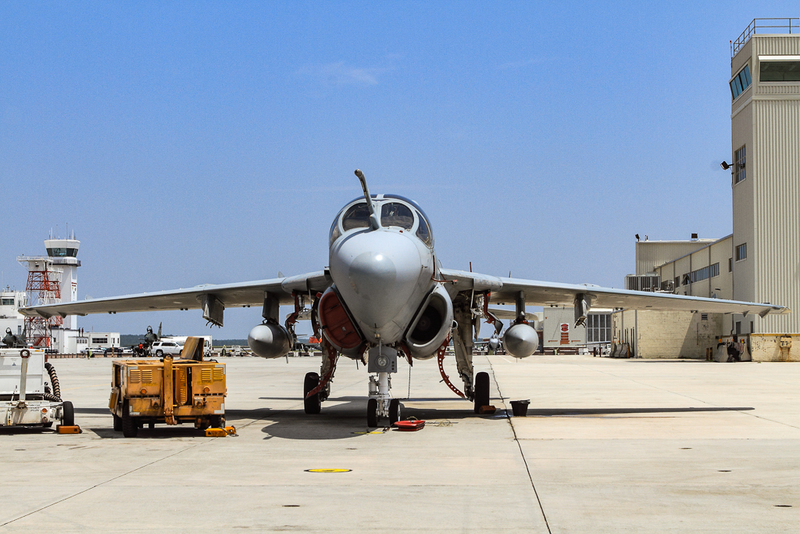 These exercises are designed to simulate any possible threat. This includes: cyber, space, conventional, unconventional, and more. 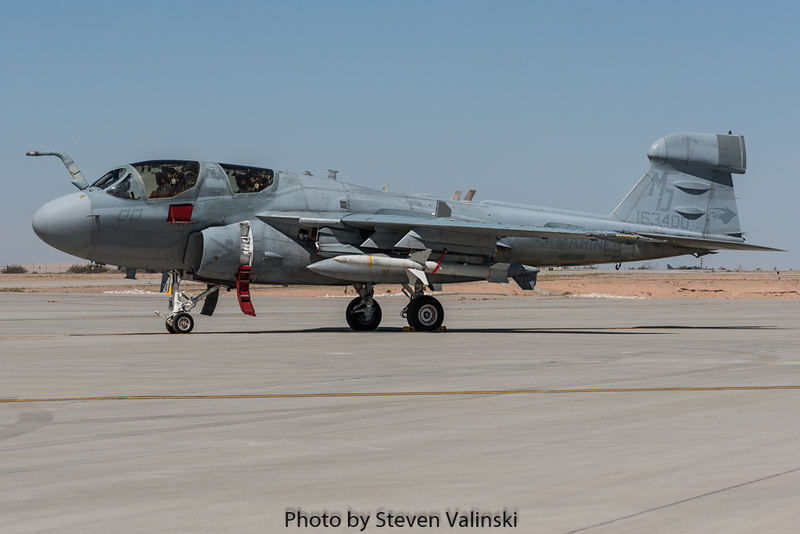 With VMAQ-3’s recent participation in WTI and Red Flag, the squadron has made great strides in showing how the Prowler can integrate, and what it can bring to the fight. The lessons learned during these exercises could be the difference between life and death for any number of personnel in battle. With the sundown of the Prowler set for 2019 for the USMC, there are ongoing discussions as to what airframe will fill the role that the Prowler takes on now. 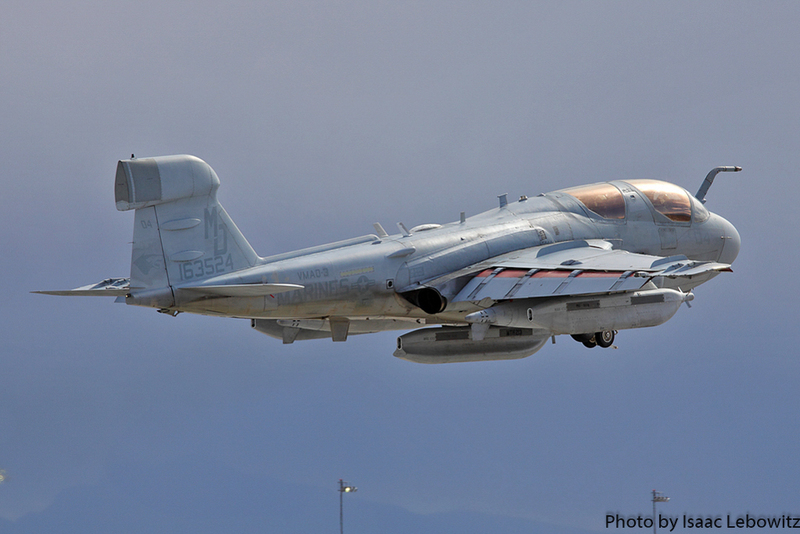 While some believe by 2019, the Lockheed Martin F-35B Lightning II could fill some of the void, especially the digital interoperability piece, according to the 2015 Marine Aviation Plan; MAGTF EW is the new approach. 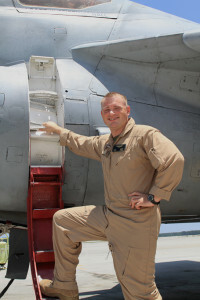 LtCol. 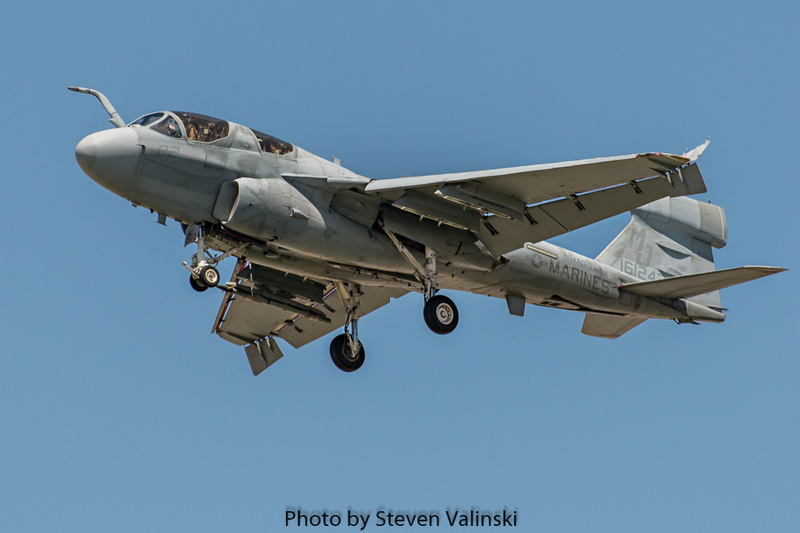 Manka elaborates on this topic, “In this case, you’re not going to see it transition from one airframe to another, not a singular airframe. So, probably the better way to view this is: what is the Marine Corps going to do in the electromagnetic spectrum? 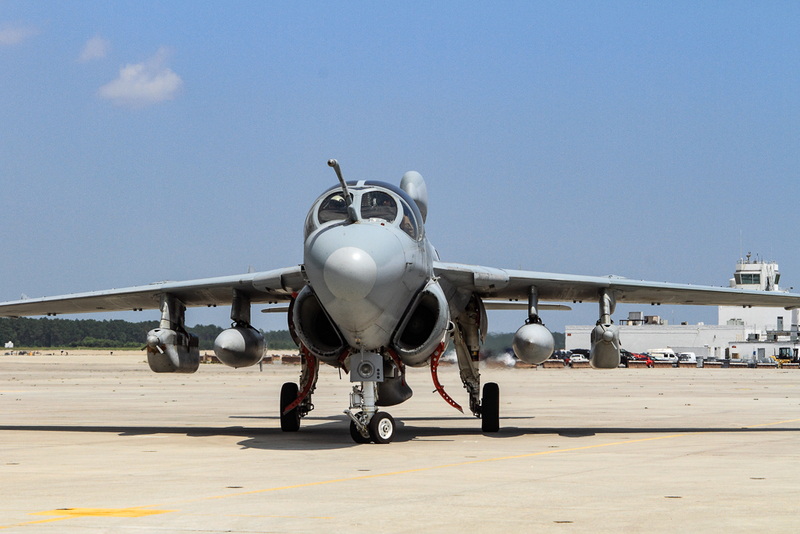 The truth is it’s not going to be in a singular airframe. It’s going to be spread across the VMU (Marine Unmanned Aerial Vehicle Squadron) community with our unmanned aerial systems. It’s going to be on the ground. It’s going to be in cyber space. 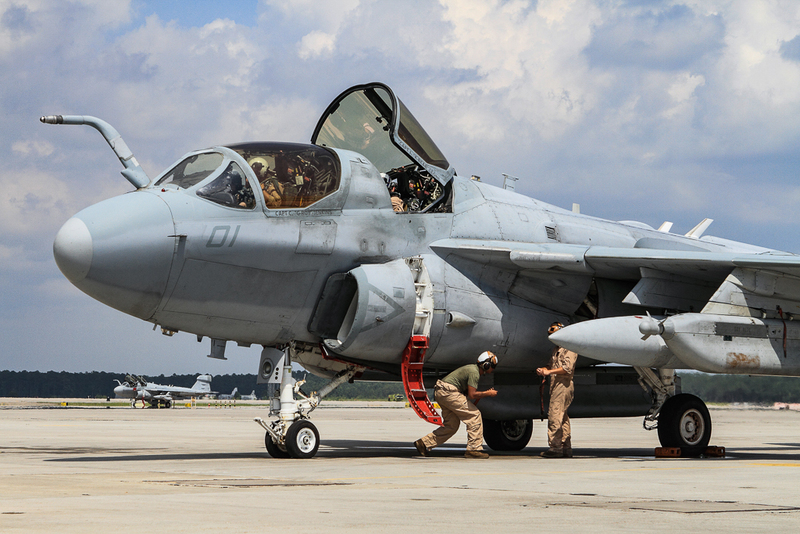 Quite frankly, we have to think differently how we approach RF and cyber, it’s no longer going to be a single platform thing for the Marine Corps,” LtCol. Manka told APD. 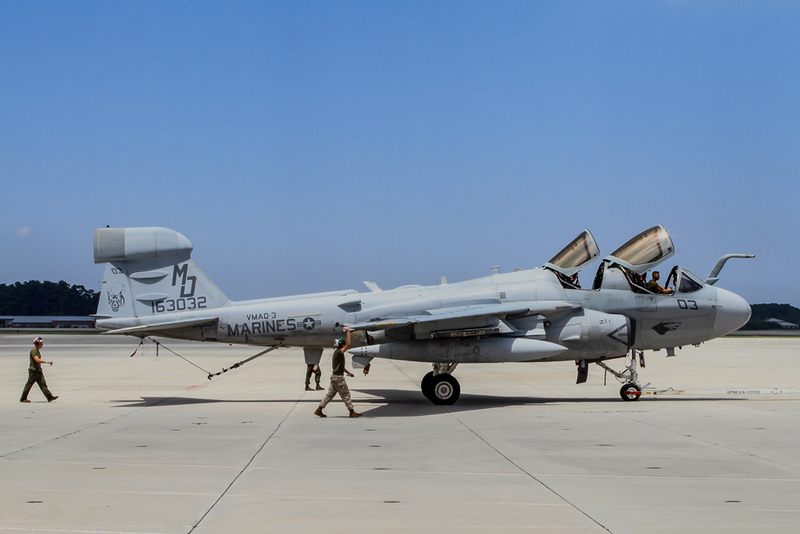 While the unit continues to participate in military exercises around the world, VMAQ-3 and the venerable Prowler have proven that they are a vital component of the MAGTF that can integrate well with U.S. and coalition forces. 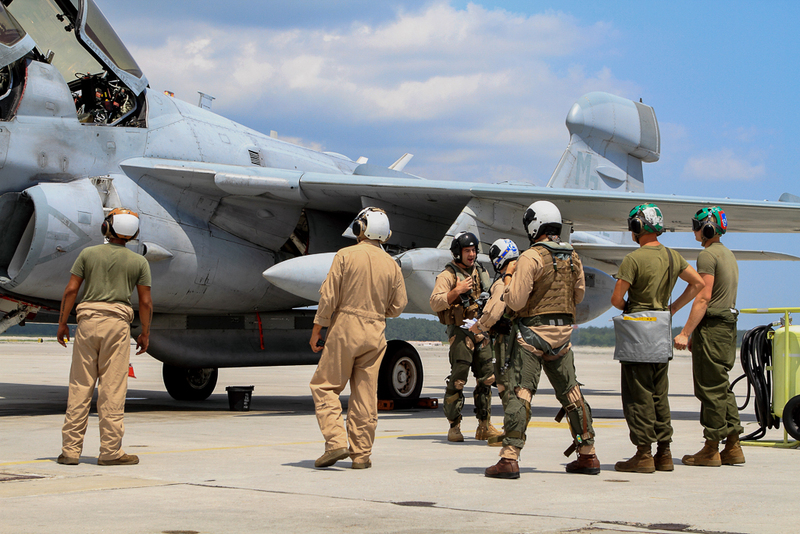 Furthermore, the Marines that make up the squadrons will continue being an asset to the Marine Corps and its mission. 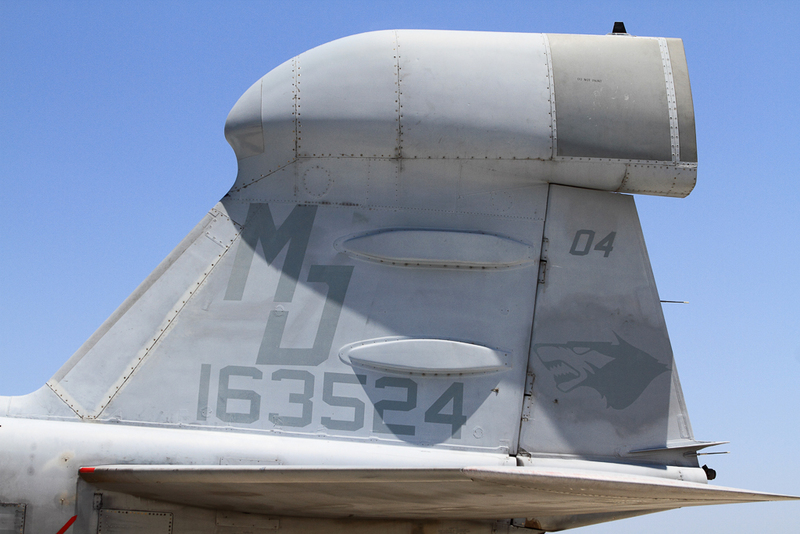 The Marine Aviation plan explains that UAS are a critical component of the MAGTF EW concept. As such, EW expertise normally resident within the VMAQ community will begin to transition to the VMU community beginning in 2015. 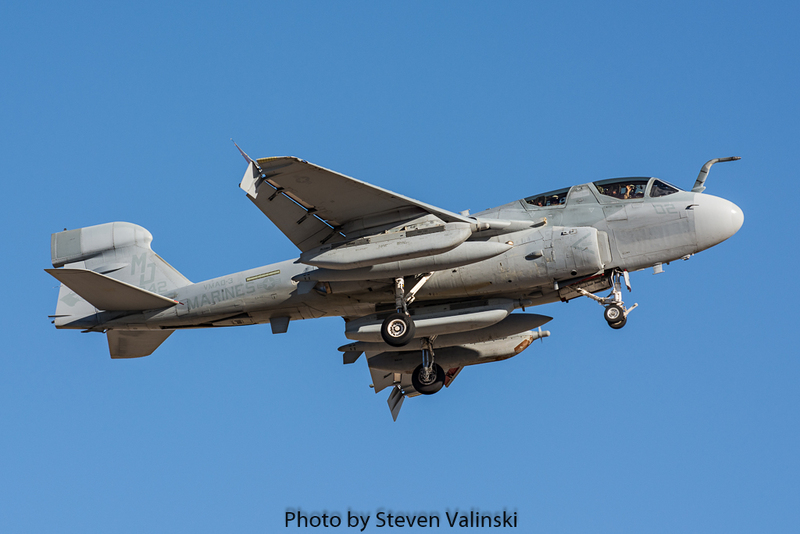 Manned airborne capabilities post-2019 will be provided by EW payloads such as the Intrepid Tiger II EW Pod, Unmanned Aircraft Systems EW payloads, and the EW capabilities inherent to F-35. 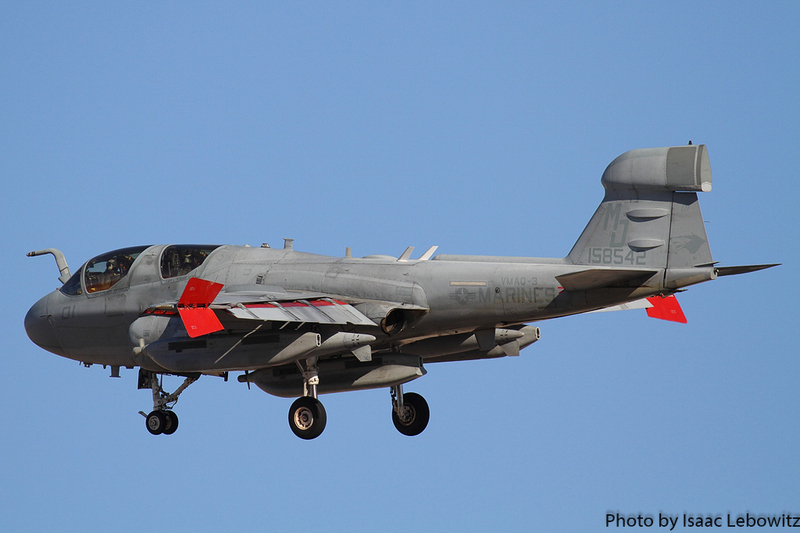 As the 2nd MAW celebrates the 75th anniversary of the Wing in July of 2016, new traditions begin with 5th generation airframes such as the F-35. Moving forward, VMAQ-3 will continue set an example for the rest of the Wing with an old, but reliable, airframe equipped with the latest technology in AEW. 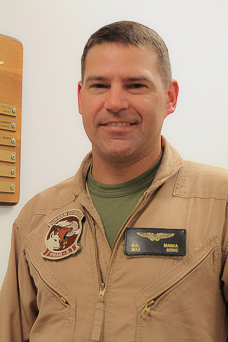 Acknowledgements: APD would like to thank Lieutenant Colonel David L. Manka, Major C.E. Jernigan and Captain Derek “Big Baby” Geyer for their cooperation with this article. In addition, special thanks goes out to Lieutenant Maida Kalić for all her hard work in making this article possible. Born in New York, NY, Ed moved to Puerto Rico when he was 9 years old. 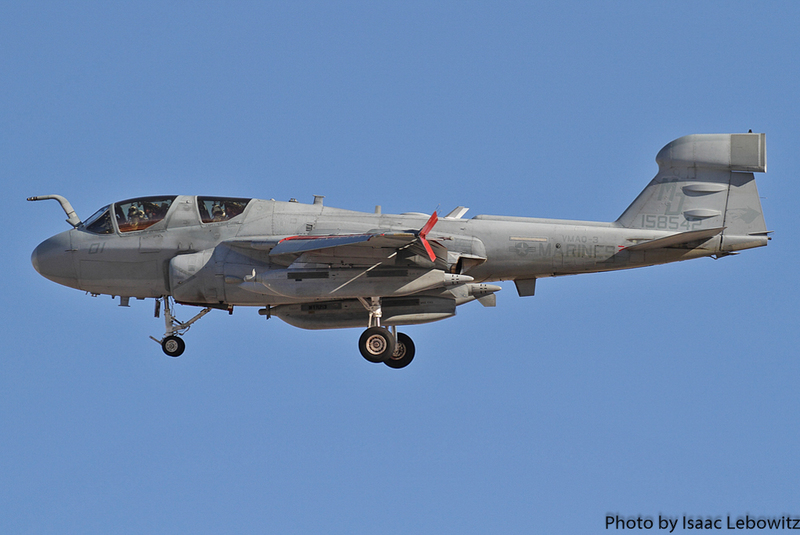 It was in Puerto Rico where Ed's love for military aviation began. 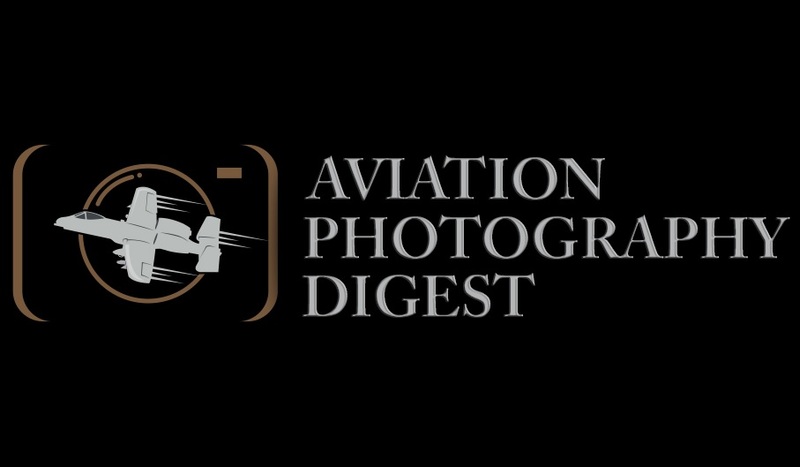 Watching the A-7's of the Puerto Rico Air National Guard (PRANG) inspired Ed to take up aviation photography in 1989 with a small point-and-shoot camera. 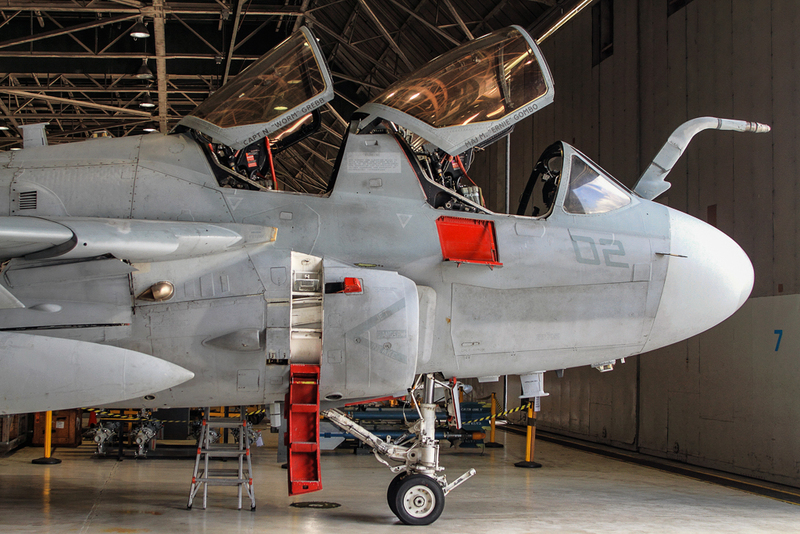 Before the retirement of the F-14 Tomcat, Ed had multiple air-to-air photo shoots with the Tomcats of NAS Oceana. 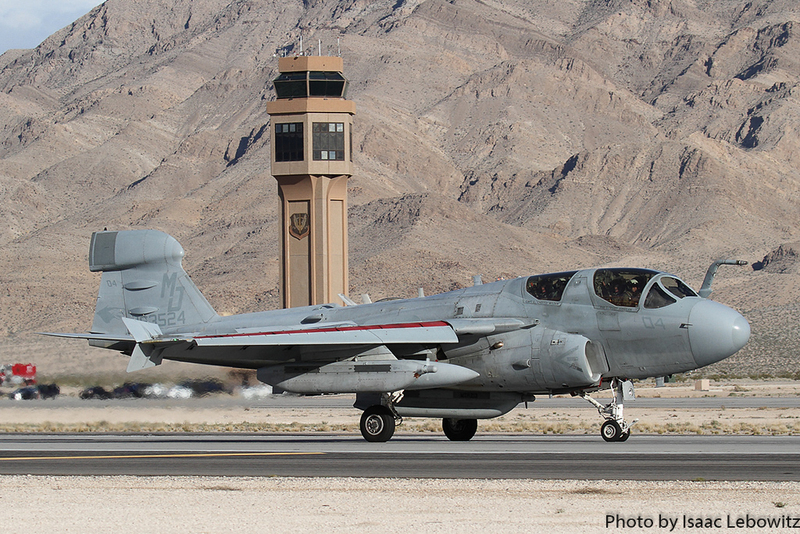 He has also covered many Red Flag exercises at Nellis AFB. Currently residing in New Jersey, Ed shoots with Canon cameras and lenses.